The issue of time/self management plays a major in new leaders’ ability to succeed. No matter how brilliant your ideas are, if you aren’t managing yourself effectively, your results, your work, your happiness SUFFERS. I’ve written and spoke a lot about the why & how time/self management tends to be the LEADING CAUSE OF DEATH in new leaders. “Dave, what have you seen successful leaders do to be organized day by day? I feel I need a better skeleton than I’ve had – maybe I need to go to a franklin planner or something… I know everyone functions, remembers, and acts differently but I’m thinking there is a wheel out there rolling somewhere that I can jump on and customize rather than sitting over here designing a new wheel. To give you an idea of where I personally fall short (big fat looks in the mirror, and many partners giving feedback – these are some of my areas of necessary improvement). Giving assignments and forgetting to follow up. On occasion I let people off the hook with a great excuse. This goes back a bit to setting clear expectations, but If I don’t do numbers 1 and 2 above I can’t possibly hold people accountable properly. I know that there is not a quick fix for these issues, but I would love to be able to develop a strong system that can help offset my weaknesses and give me the structure I need to be an effective transformational leader… Any ideas are welcomed. Observation: Talk about humility/trust!? It’s a very rare leader and a very rare organization where being that vulnerable is not just OK, but expected. Usually our EGO gets way in the way and we can’t show weakness … and therefore we don’t improve. Impressive. I feel your pain. You sound like me at Desert Sky and the start of Victoria. Almost word for word. For me it took experimentation. I gave the franklin planner a good few years. I went paperless and tried everything Outlook and then the mac had to offer to get organized. Lots of trial and error. I’ll tell you where I’m at today because I’ve found a system I love. No guarantee this will work for you. There are 5 important aspects to my work that I consider ‘blocking and tackling.’ These are the organization and follow-up responsibilities that I have historically struggled with that are somewhat related but different enough in how I prefer to experience them that I haven’t found an all-in-one solution. I use iCal on my mac and iphone. Here’s what I love about this. My wife’s computer is also a mac. We have a mobileme account that syncs all of our contacts and calendar items. I can make different calendars that I can click on/off depending on what I want to see. The homerun is that Jess can see my work calendar which helps catch things (travel/meetings) that I failed to communicate. I can also flip on the kids’ calendar for sports, practices, activities, etc. when I make my plans so I can arrange to be there more if possible. The calendar syncs with Ensign’s Outlook server so I can send/accept meeting invites from it too which is clutch. Having the reminders/alarms on my computer and phone is necessary for me. If this were paper based like it has been in the past, I’d miss half my appointments and conference calls. The image below is of my calendar for this week. You’ll notice the checked and unchecked calendars on the far left panel. The blue is family stuff and that is basically Jessica’s calendar. Regarding the related item of ‘following up’ … I’ve learned to take a page out of the Monkey doctrine for this. And, it has made a HUGE difference for me. Anytime I can assign my responsibility of following up to someone else, it gets done. For example, I asked “Virginia” (name changed for the blog) here at the service center for help in setting up CEO-in-Training (CIT) weekly call guest speakers. 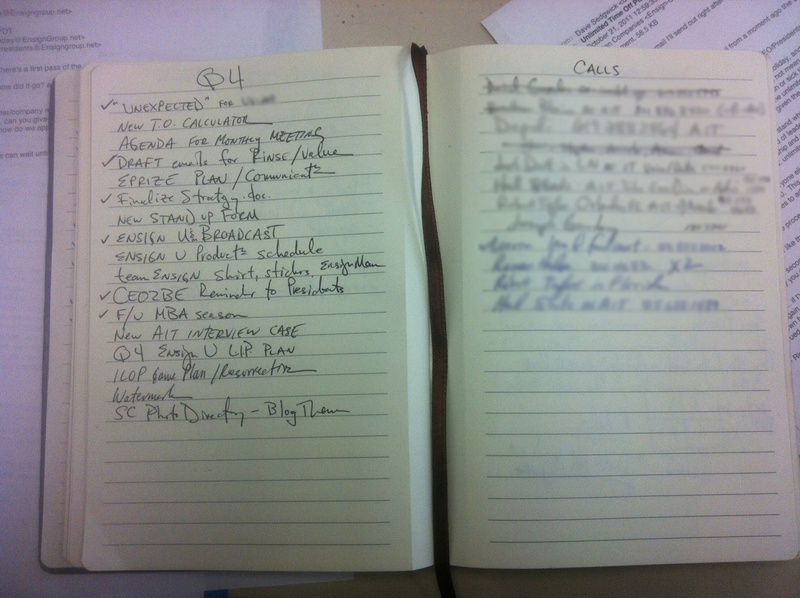 I spent 30 minutes with her mapping out who I wanted to talk on the next dozen weekly calls. I then gave her the task to contact all those people, send them the calendar invite (and to copy me) and to send us both reminders on the Friday before. What used to sneak up on me each week has turned into something much more meaningful for the CITs. No dropped balls. No “dangit, I forgot about the call.” Just another little example … during yesterday’s CIT call, I decided to have the closest to the pin competition again. Whoever gets closest to their projected EBT wins a dinner for two. The old me would have taken the responsibility on myself to take note of everyone’s projections on the 31st (I would have to put a reminder on the calendar to do that) and then check the actual EBT results when financials came out. But, yesterday I said to Mike in CO, “Mike would you run the competition for us this month?” He said, “Sure.” Will it get done? Yes. He already sent the email to everyone requesting them to send their projections to him at the end of the month — passing the monkey down the row!! I love it. Off my plate. Assigned to someone else. Bingo. 1) anything you assign yourself or accept from a subordinate that you don’t do is PROCRASTINATION. Anything your supervisor (and you could make the argument, your cluster partners) gives you that you don’t do is called INSUBORDINATION. 2) An inferior job done by a subordinate is infinitely better than a superior job procrastinated and never done by you. Therefore, I also give the responsibility to follow up on things my subordinates. Meaning, if I give an assignment that I need to follow up on I will also assign the subordinate the time and place for them to account for their work. “Great. Thank you so much. Will you let me know on Thursday by the end of the day how it went?” I then put a reminder on my calendar at 3:00pm to call/email F/U the issue. I can’t talk about Assigning work/To-do’s (below) without talking about monkeys. The more you have time to just work on your stuff, the more effective you’ll be. If you find your subordinates checking on your commitments, you’re working backwards. Whoever says, “How’s it coming?” is the supervisor! I love my Moleskine. Pictured below at Amazon. I use it for all 4 of these parts of my work. 4th Quarter Projects/To-Dos/Monkeys I’ve accepted, given myself, or been given on the left page. Calls to return on the right page. I will recreate this several times per book. 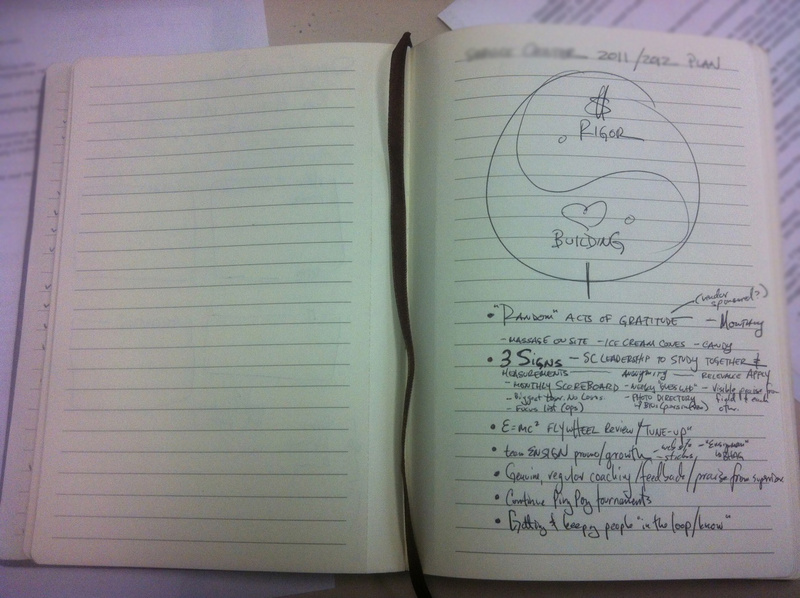 Idea, brainstorming generation … In a previous moleskine I have the notes, drawings, etc. that formed the eprize. I treasure some of these a-ha moments and I’m stoked I have them all in one place. My personal life and work life interact all the time. I use the moleskine for both. Below is a song I wrote Jess. Here’s what I love about mixing work, personal, and church note-taking, brainstorming, tasks, etc. all in one. This is the ultimate journal. Yes, I write formal journal entries about my life in here too. But, it will show my kids/grandkids more than just what I wrote about my life. It will show them what I did. What I worked on. Who I supervised and who supervised me. It will show what I dedicated my time to. It will show them a creative/professional side to me that they don’t see as just their dad. And, it is an awesome record for me to keep of my life for all aspects of my life as well. At the end of the year, I look back page by page and reflect and lift my sights and set goals. Having one notebook like this also makes it easy to not forget it. I take it with me everywhere. 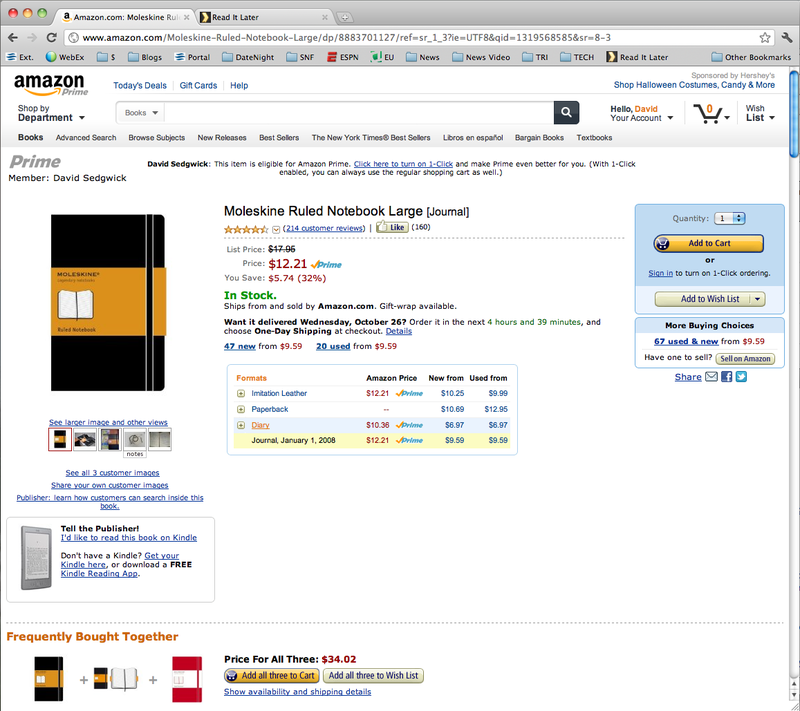 And, it’s way skinnier and lighter than a franklin planner. Also, the free-form vs. day by day approach is better suited to me. I never liked the day by day franklin format b/c there would always be some days where I would need to take 7 pages of notes and then weeks without needing the notes section at all. This one is more personal. It’s less about tools and more about a shifting of mental/emotional/leadership gears that I was forced to learn the hard way. The reason I let people off the hook was, looking back, more about me than about them or results. I wanted to be liked. Very much. Not wanting to hurt feelings b/c I wanted to be liked. Not holding people accountable b/c I feared I would lose their admiration or lose them altogether. Ironically, that philosophy/practice is incredibly undermining and ineffective at getting people to like me. With each subsequent facility I ran I became more and more rigorous with my standards and expectations and accountability. And, again ironically, I would venture to say that each subsequent facility ‘liked’ me more than the last. I stopped worrying about myself and whether or not people liked me and instead focused as much as possible on results. That creates an environment that people really appreciate and respect. Letting people off the hook isn’t for them, it’s for me. I stopped doing that b/c I realized that I was hurting them and myself as a leader. It’s not easy, but it’s become very natural now for me to be frank, direct (you can still be kind and encouraging), and quick in my feedback and/or correction. These aren’t quick fixes like you said. I’m stoked you’re looking hard in the mirror on these things though because I believe that these make up the ingredients needed to fill the gap between new leader and game changing CEO. I’ve see it in myself and countless others here at Ensign. Good luck hermano. Let me know if I can help with anything. Worth the wait. Thank you. As you can imagine, I didn’t wait in taking action on these issues as I have really felt the pain and want to bring relief asap. I am attaching my first attempt at being able to keep myself more organized and structured on a day to day basis. In reading up on time management techniques recently (including re-listening to Monkeys) I determined that I am only going to focus on quadrant I and III with the things that I even allow to get to my list. So I start each day by bringing forward my quadrant I and III from the previous day and new additions. I type in the new items from yesterday and remove items that I accomplished yesterday. I print this out and put it in a binder that I have labeled with days 1-31 so I can track day by day what I’m accomplishing as well as when something that was supposedly urgent AND important hit my quadrant I and why it is still there. I have a column for assignments/monkeys so I can follow up on assignments I have made as well. I keep this binder open on my desk and hand write in new additions and check off accomplishments. It has been a little slow going since my initial list of Q I and QIII have accumulated for quite some time. I find that I am having much more success making assignments and avoiding “Procrastination” then I have done in the past. This is not a perfect system, but so far it is really helping me know where I am and where I need to be. 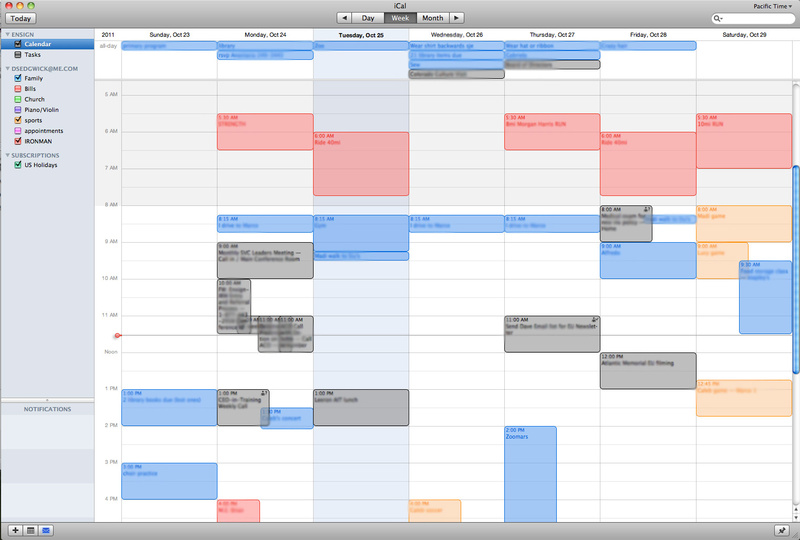 I LOVE the idea of integrating the home/work calendar. My wife uses the Mac and this could help me both at work and at home. 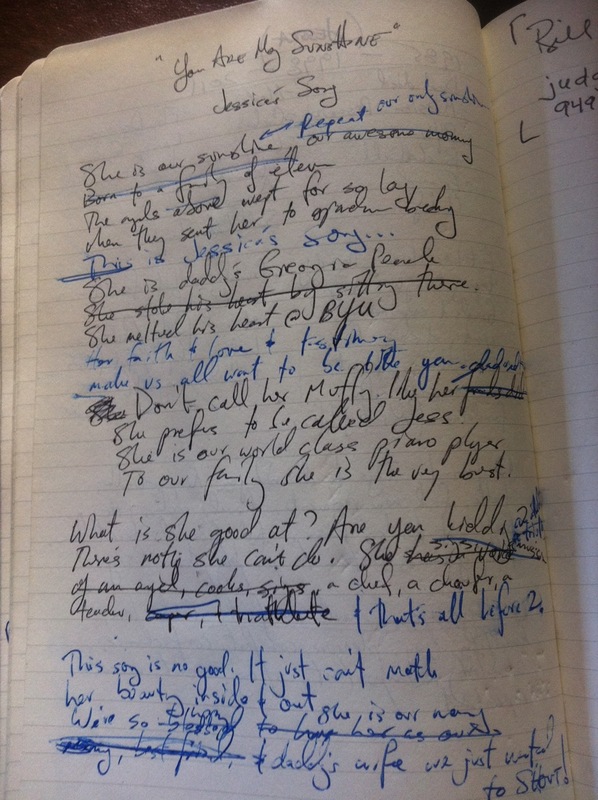 Moleskine: I’ve been using disposable notebooks and transferring the info that I accumulate, but I can see real value in preserving and reviewing from all aspects of life. I think I will find myself incorporating that one as well – dig it. #3 – Work in progress still. I relate very much to your statement on this one. Not holding my team accountable is a “me thing.” I’m resolved to change – some of my team have already commented about a few little things with me. Its encouraging. There will be more pain I think, maybe even some rebellion. I’m getting kind of excited and looking forward to it – that might sound kind of sick, but I’m ready to take it on and stop running in circles. Thanks for this – I’ll be touching base on it. I’d love some follow up – you can put it on your people to email list for a few weeks/months down the road. Without humility and vulnerability on the leader’s part, his growth is stunted. Without a culture that makes it safe to be vulnerable and reach out for help, the leader’s and organization’s growth is stunted. Self awareness & humility is often the differentiator between those who get second and third chances and those who don’t. Managing time is impossible. It marches on no matter what you try. We can only manage ourselves. We need to take it seriously and experiment until we find what works with our unique personality. I hope this helps you get a better grip on how you organize and manage yourself.